Disfrute de un tour de vinos por la mañana desde Venecia a la región de vinos espumosos de Valdobiaddene, ubicada a menos de una hora en auto hacia el norte. 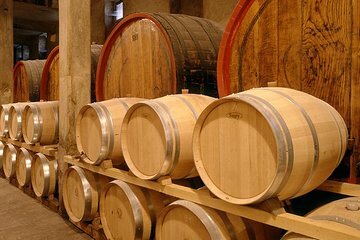 Visite una bodega local para ver las bodegas y aprender sobre el complejo proceso que da a los vinos "espumosos" su efervescencia. Pruebe varios tipos de Prosecco italiano y otras variedades, y pasee por los hermosos viñedos en esta encantadora incursión en la región vinícola de Veneto en Italia. Visite la renombrada región vinícola del Veneto. Recorre una bodega y observa cómo se hace el vino espumoso. Apóyate en las diferentes clasificaciones del vino espumoso DOC italiano. Degustación Processo y otras variedades. Disfruta de tiempo libre para pasear por los viñedos. This was a wonderful tour!!! Our guide Caterina was wonderful. She was knowledgeable about all the Astoria area and what she didn't know was answered by the helpful people guiding us throughout the winery. Anyone interested in the Champagne and Prosecco, or just those that like to drink them, will love this tour. Catarina took us as she is TERRIFIC! She also does tours to Ferrari and Lamborghini if interested Her English is excellent, she is wonderfully personable and a safe driver. She took us to a some unique places and we tried and bought some truly magnificent wines which we drank in Venice. BOOK THIS TOUR. Catarina is an amazing guide for this half day trip. We were the only two booked on this day and felt very special. Catarina was generous with her information and time and even gave us a small gift at the start of the morning. The two prosecco canteens you visit are both family businesses and provide different styles of prosecco to try. At the first canteen Astoria we were also able to have a look through the area where the prosecco is made. We walked away from the half day with 5 bottles to take home, it's all reasonably priced! I highly recommend taking this half day tour! Thank you Catarina, we enjoyed our morning immensely. Really great tour the prosecco region is beautiful. The two wineries you visit are really great--wonderful, delicious prosecco to taste!!! The scenery is magnificent and you get a little bit of time to enjoy the area and spend some time outside of the city. The tour guide is knowledgeable and friendly. Prosecco to purchase is very reasonably priced and of the best quality. You get to learn how prosecco is made from start to finish, the facilities are really wonderful. Overall, great half day tour.